New Delhi: Jindal Global University and Tel Aviv University in association with the Middle East Forum launched a two-day joint conference on ‘India-Israel Academic Dialogues: Political and Cultural Crossings’ at the India Habitat Centre, in New Delhi, today. This two-day engagement is an initiative by the Jindal Centre for Israel Studies (JCIS) to understand the opportunities and challenges facing the two countries keeping in mind their political and cultural specificities. An ideational exchange between professors and students from the two universities, the conference aimed to understand the complex nature of both societies and explore possibilities of future collaborations in different fields. Talking of the deep historical relationship between the two countries, Dr Shashi Tharoor, Member of Parliament & Chairman of the Parliamentary Standing Committee on External Affair pointed out that academic institutions have immense power in strengthening bonds between the two countries. 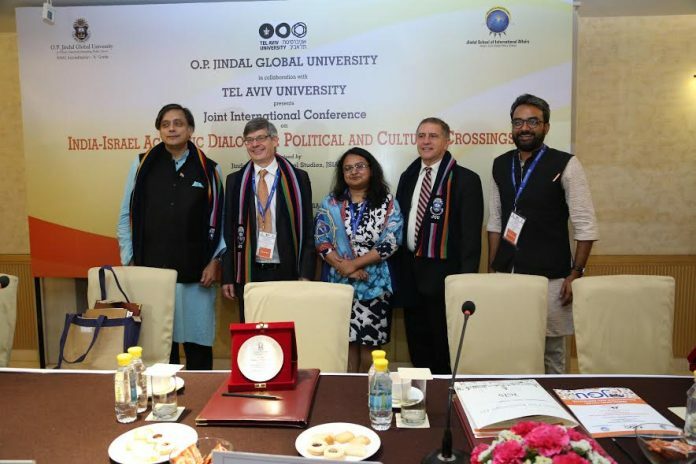 The cross cultural dialogue between Indian and Israeli academics aimed at providing a better understanding of the complex nature of the two societies and explored common interests for future collaborations. In the Indian academic context, the Jindal Centre for Israel Studies at JSIA has been pioneering the field of Israel Studies its inception in 2012 and this conference is one of the many initiatives towards that objective. It was on March 30, twenty-five years ago that India and Israel first established diplomatic ties. The Jindal Centre for Israel Studies at the Jindal School of International Affairs University chose this landmark day to host this conference. Jindal Centre for Israel Studies at the Jindal School of International Affairs is the first of its kind dedicated to the field of Israel studies within the Indian academia and is committed to advancing India-Israel bilateral engagement. Panellists at the two-day conference included diplomatic luminaries, academicians and political professionals. Prominent participants who shared their views and insights today included Professor P R Kumaraswamy, Centre for West Asian Studies, Jawaharlal Nehru University; Ditza Froim, Minister Counsellor, Head of Public Diplomacy, The Embassy of Israel in India; Bharat Karnad, Research Professor, National Security Studies, Centre for Policy Research, New Delhi; Kanchan Gupta, Political Analyst, Commissioning Editor & Commentator, ABP News; Professor Ilan Troen, AJC-API Visiting Scholar in JCIS-JSIA, President, Association for Israel Studies; Karl, Harry and Helen Stoll Professor of Israel Studies, Schusterman Center for Israel Studies, Brandeis University and Professor Emeritus, Ben-Gurion University in the Negev; Dr Rohee Dasgupta, Associate Professor and Convener, Jindal Centre for Israel Studies (JCIS), Jindal School of International Affairs (JSIA); Dr Khinvraj Jangid, Assistant Professor and Academic Coordinator, (JCIS), JSIA; Dr Pankaj Jha, Assistant Professor, Jindal School of International Affairs; Dr Silvia Bottega, Assistant Professor, Jindal School of International Affairs among others.